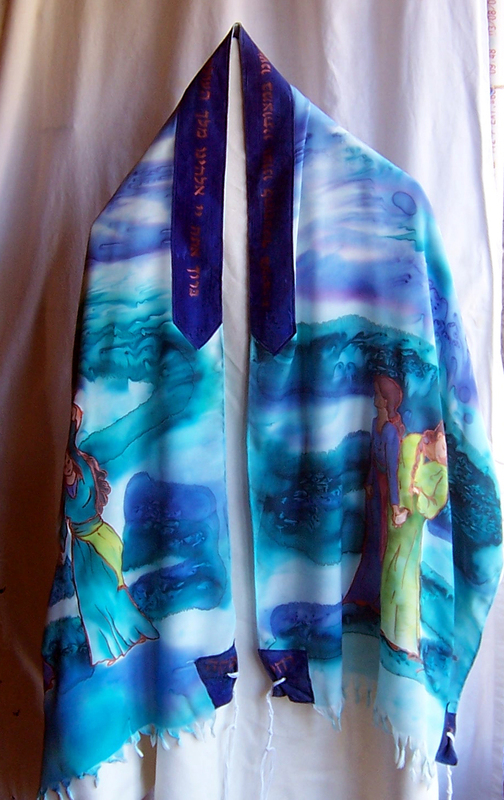 I have a customer interested in a custom tallis. I just realized that there isn’t an easy place online to see my finished (and sold) works. So, by special request, here is a quick gallery of previous projects. 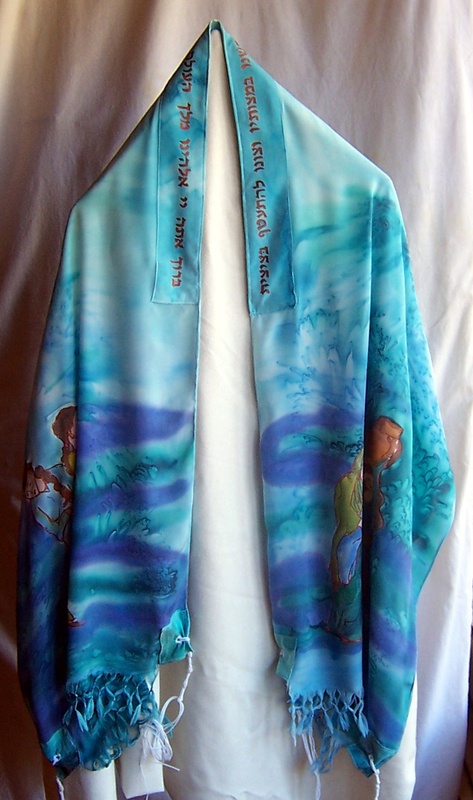 My very first Tallis. 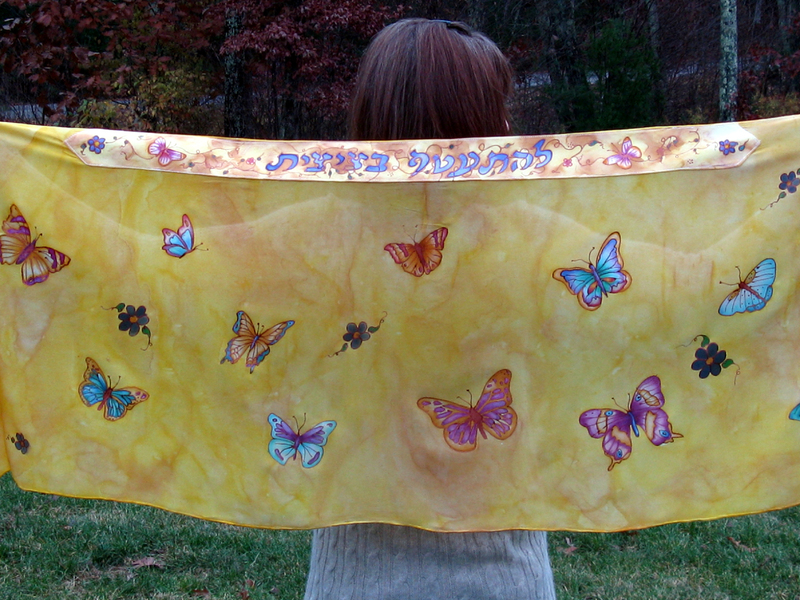 This tallit has 18 butterflies hand drawn and painted adorning a pale peach mottled background. The stripes across the bottom are teal. Still one of my favorites. 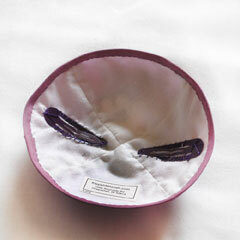 I promised the customers (some dear friends of mine) that I would never make another that was exactly like this one. Of course, that isn’t possible anyway, due to the nature of the medium. I could make a similar one, but none identical. 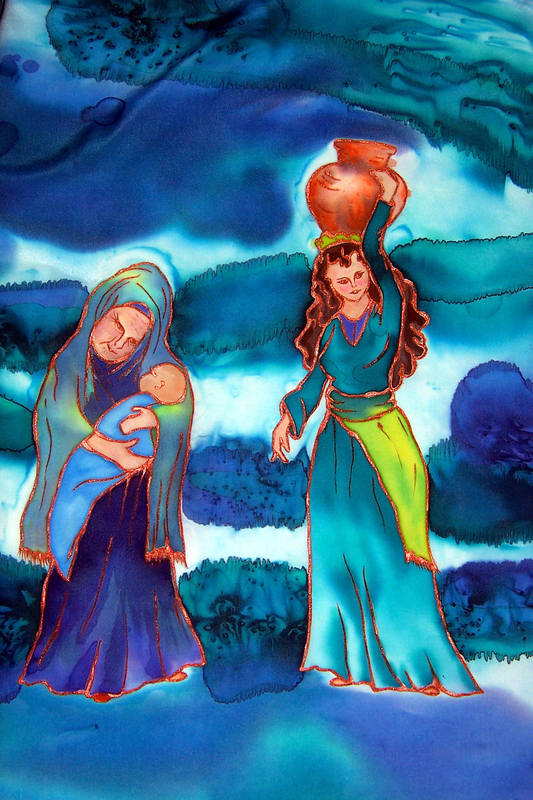 Here you see my “Four Matriarchs” tallis. 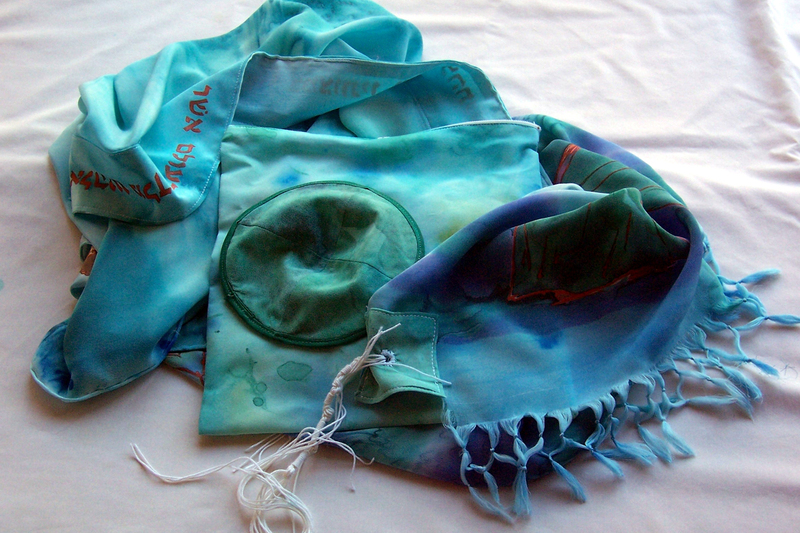 I have made two in blue, one darker and one lighter. Both have sold. 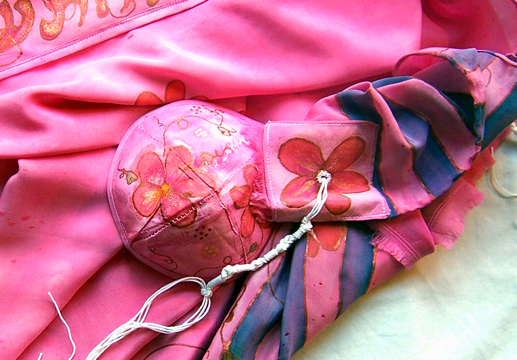 I still have the design which can be made in any color range. I have made several “Birds on a Wire” Taleisim. This is my most popular style. I originally designed it for my own son for his Bar Bitzvah. 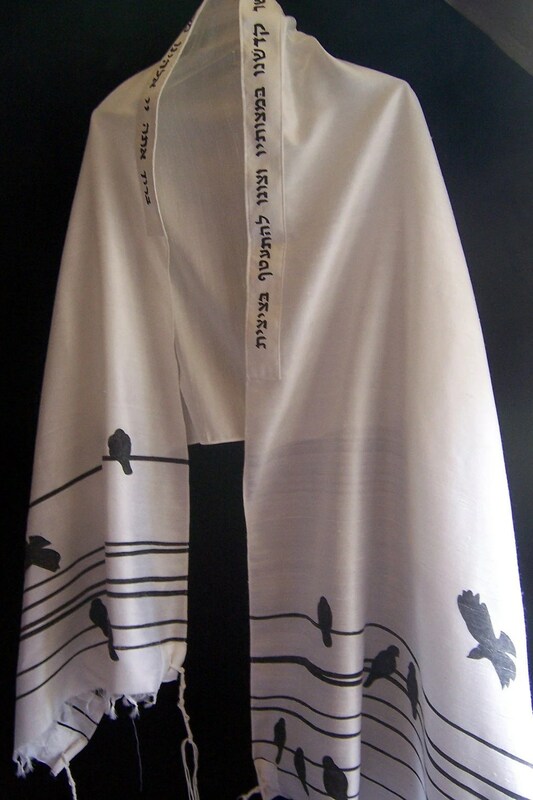 Some of these orders have had custom atarot (the band around the collar is called an Atarah). Most have the traditional prayer. 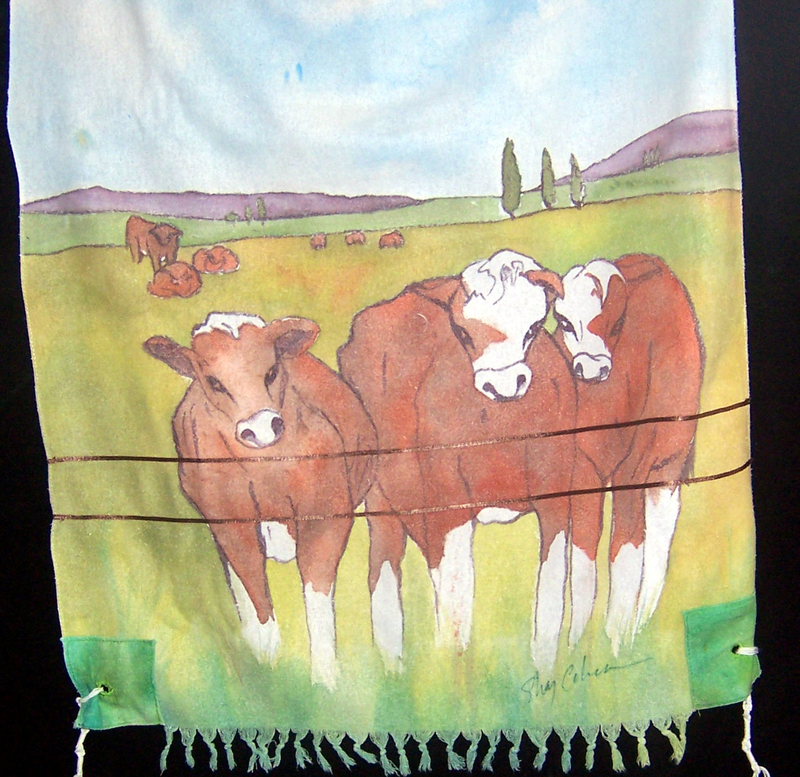 I have even made a “Cow Tallis” for a dear friend of mine who is a cattle farmer. 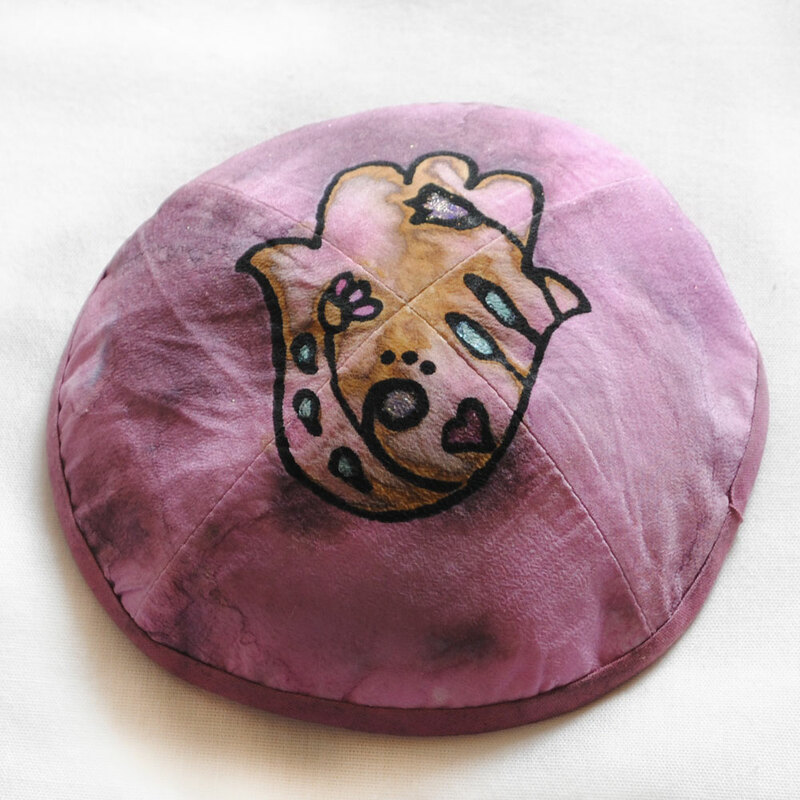 All of my talleisim come with a matching or coordinating kippah and bag and can be purchased through my Etsy shop at kippahmitzvah.etsy.com. 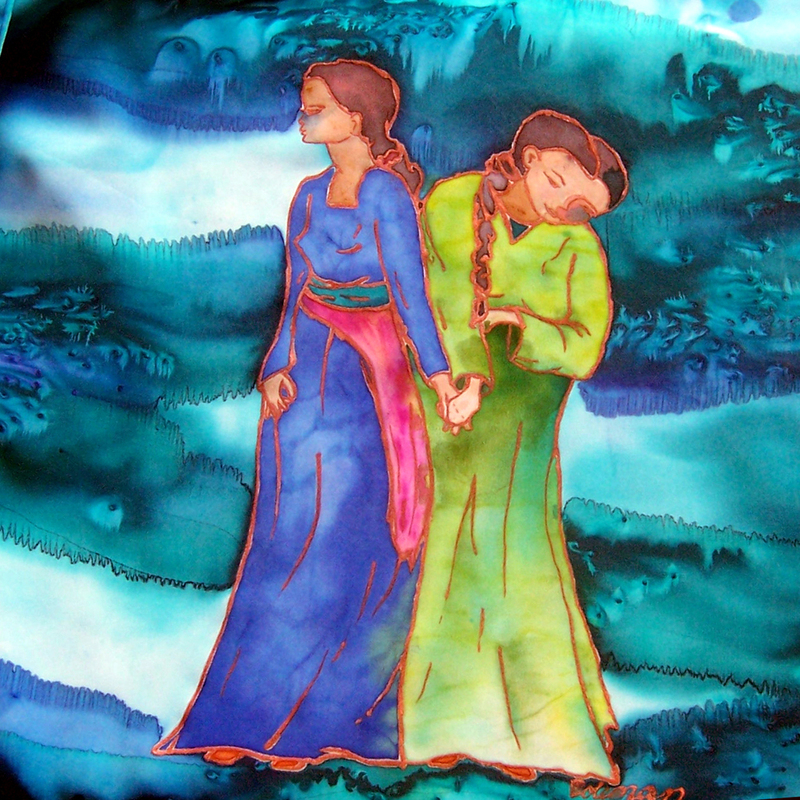 The day before valentines day I received an order for a tallis. A delightful customer is buying herself a birthday present! Which, incidentally is only three weeks after mine! I just celebrated my 40th birthday too! I have documented the process below. 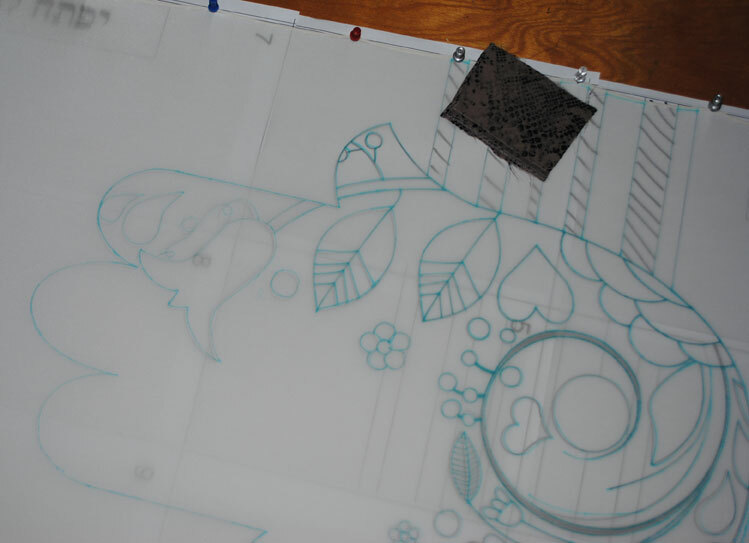 Step 1) I start with finalizing any design elements. For this design, that usually only involves the atarah. 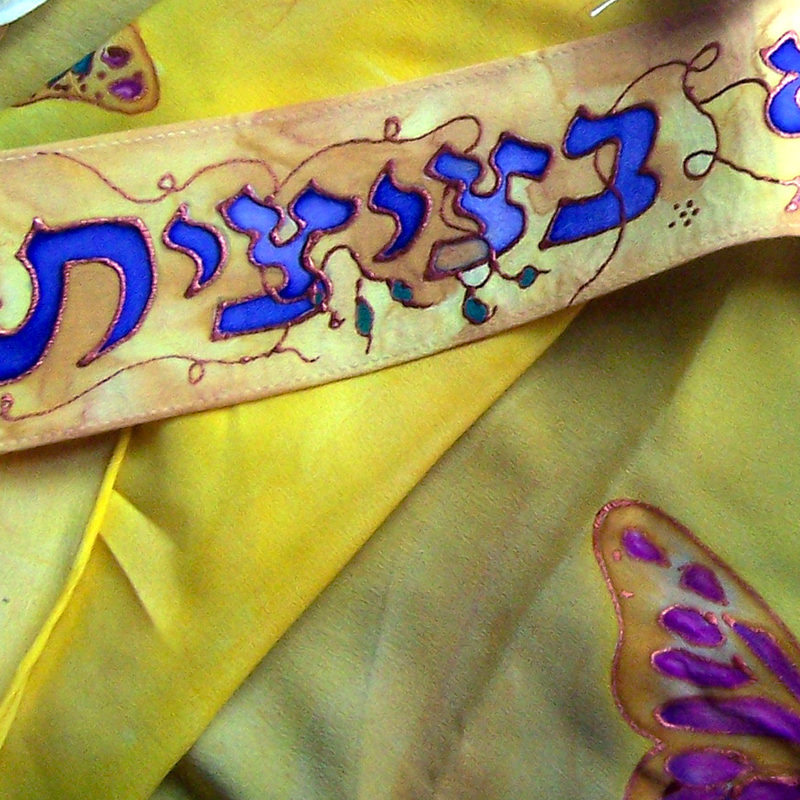 A tallis traditionally has an “atarah” or “crown” with a Jewish prayer on it. These days many folks chose not to use the more traditional prayer. This customer has chosen a less traditional but more personally meaningful prayer from The Book of Blessings . 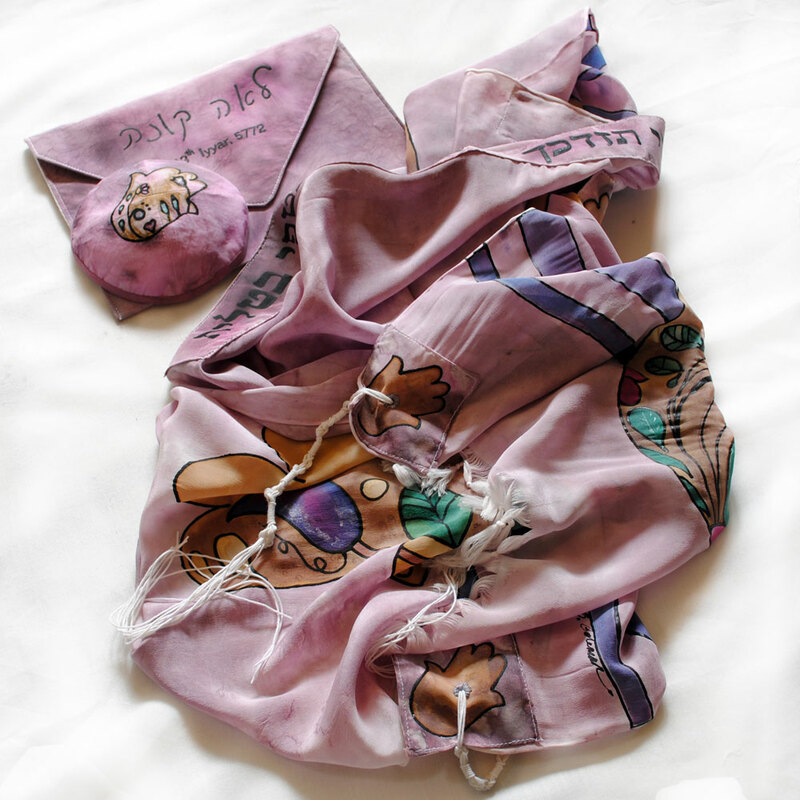 May my heart be opened, may my spirit become clear, as I envelop myself in the tallit. It took some time and a couple emails to our Synagogues new part-time Rabbi Susan Elkdosi (congratulations Susan) but she quickly found the Hebrew for me, so I could avoid any typos! 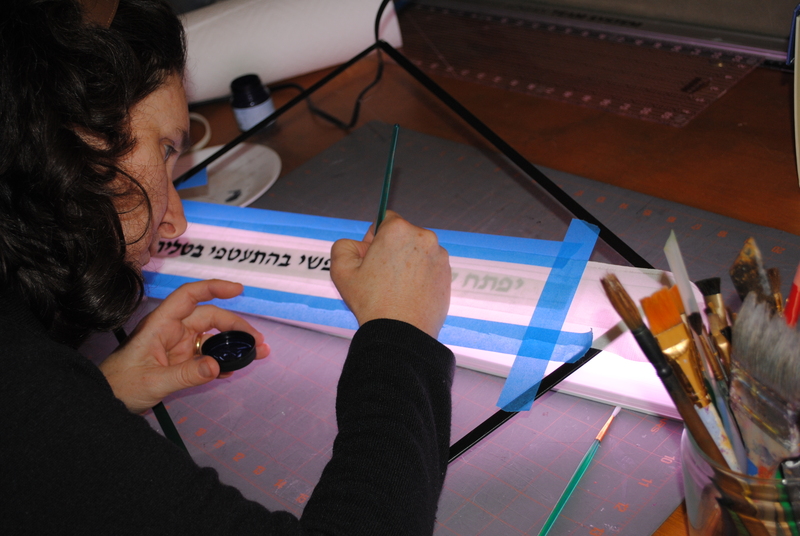 I manipulate the Hebrew on the computer for size and font, then I print it out, tape it together and get to work! 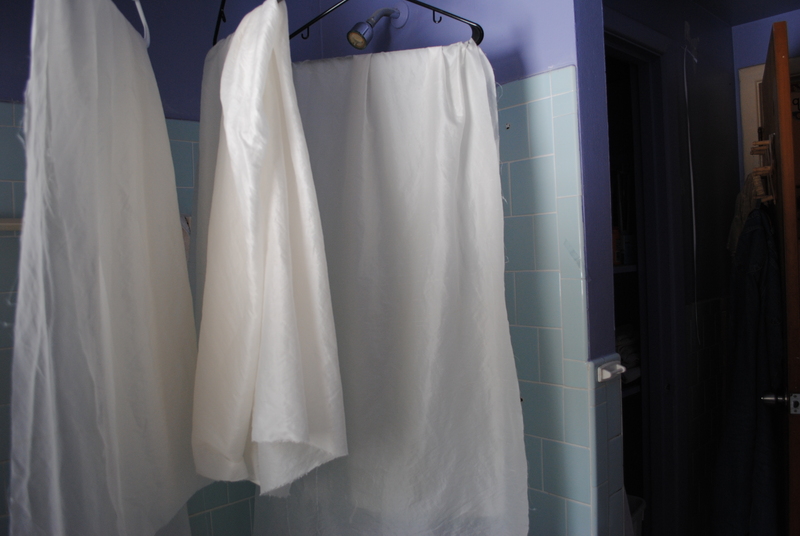 Step 2) I wash the silk with synthrapol to remove any oils or sizing that may be there. Step 3) Then I iron a piece of freezer paper on each end to stabilize the fabric. 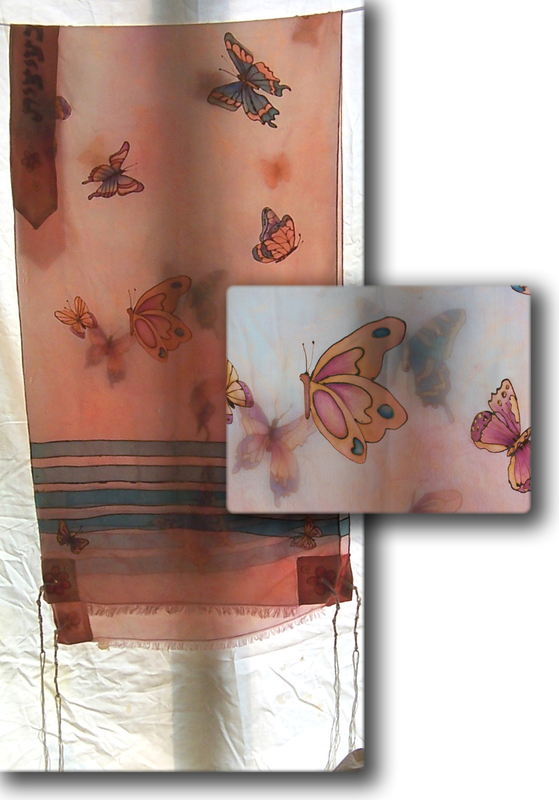 I don’t need to stretch the silk for this particular design. 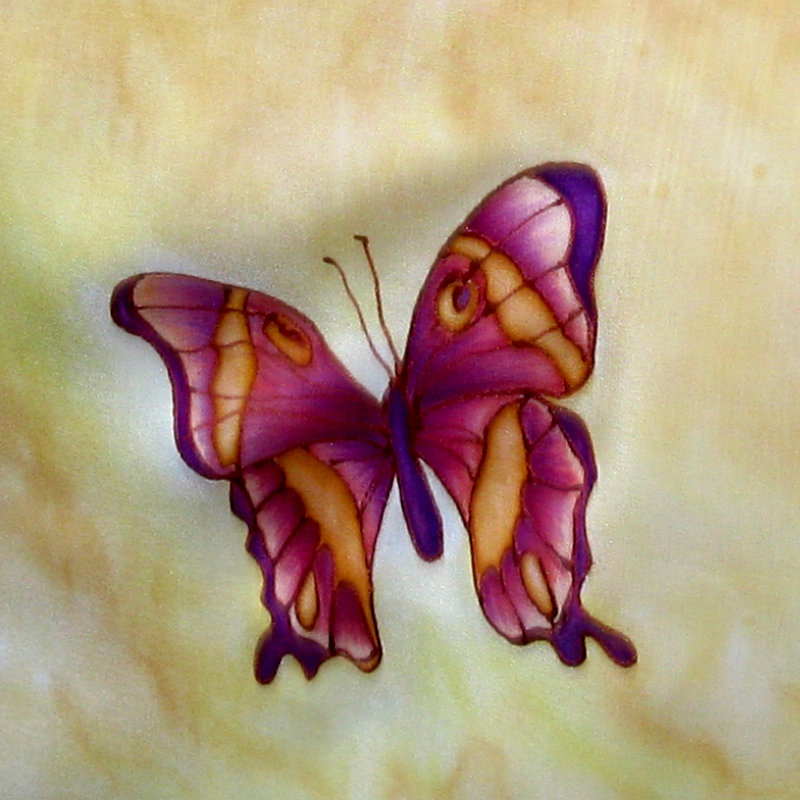 Since the pigment goes on very dry, the freezer paper is adequate. Step 4) Then I tape my template to my workspace and start taping the lines for the wire. I do this in several sessions waiting for the paint to dry between overlapping lines. 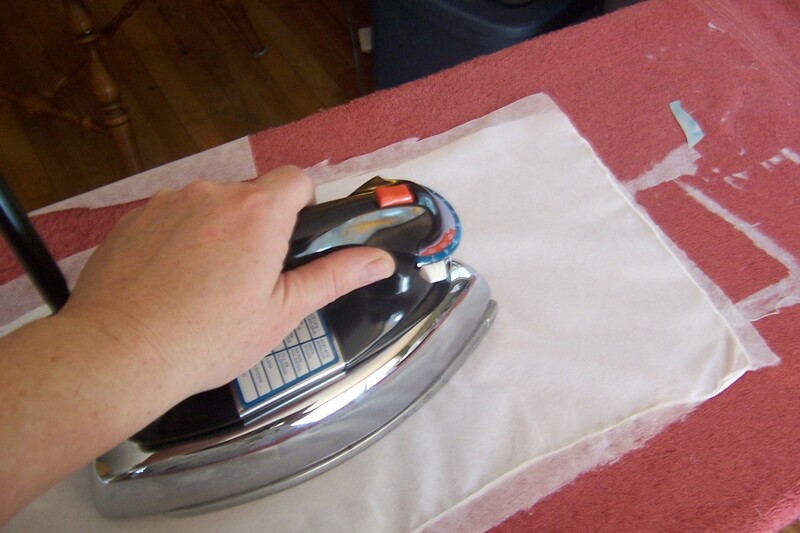 Sometimes I speed the process along a bit with my trusty hairdryer. This is why anyone in my family who wants to dry their hair has to first go rummaging through my studio! I rarely use it for my hair, which I am content to let nature take care of… probably why it’s always so frizzy! Step 5) While the lines are drying, I paint the atarah. I know Hebrew is written from right to left, but since I am right handed, I find I save a lot of smudges and re-dos if I paint it in backwards. I tape the computer printout of the prayer under the pre-sewn atarah and use a makeshift light table to see the letters below. The brush I use for this is tiny. 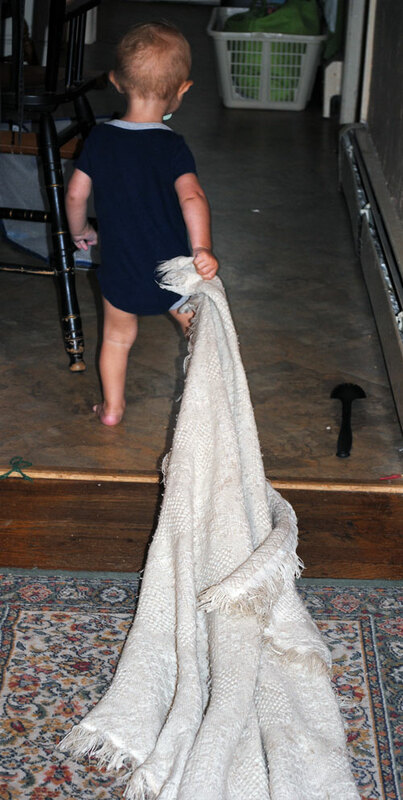 It takes a steady hand, so my children are all trained to STAY AWAY from Mommy when she’s painting a Tallis! 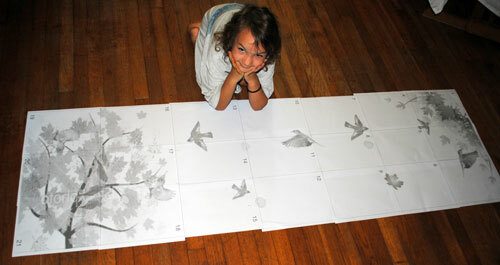 Step 6) I paint the birds in the same way. 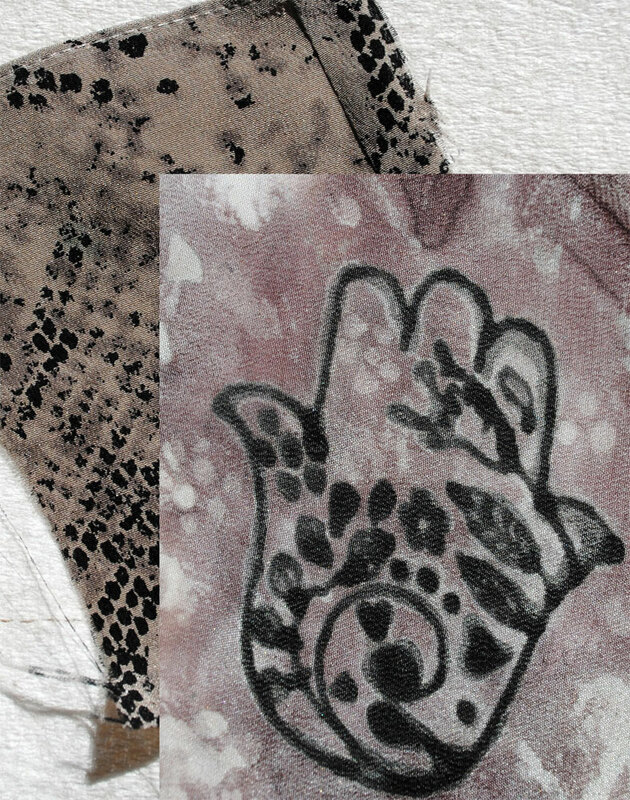 I also paint a couple birds on the bag (shown on the towel in this picture) . I decided to omit the wires on the bag this time. 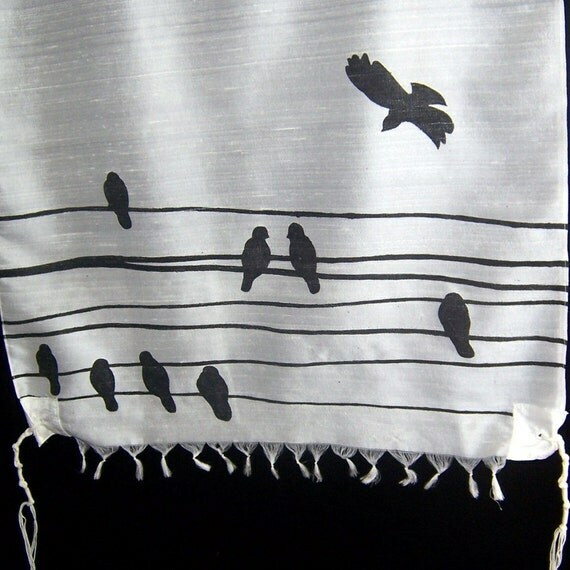 I thought it was a nice touch to just have the birds flying around the bag, waiting to land on the tallis. 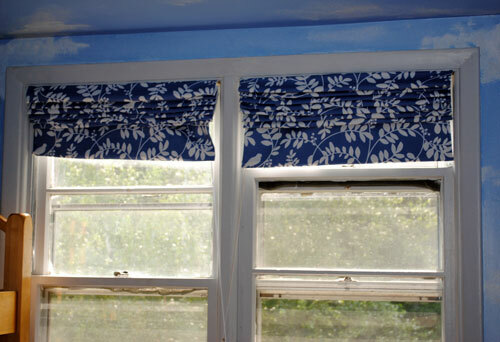 The paint is navy blue jacquard silk paint. It came out very dark navy. It looks black in these pictures, but really is navy blue! All that’s left to do on this tallis is making the fringe on the bottom, and tying the tsitsit on. 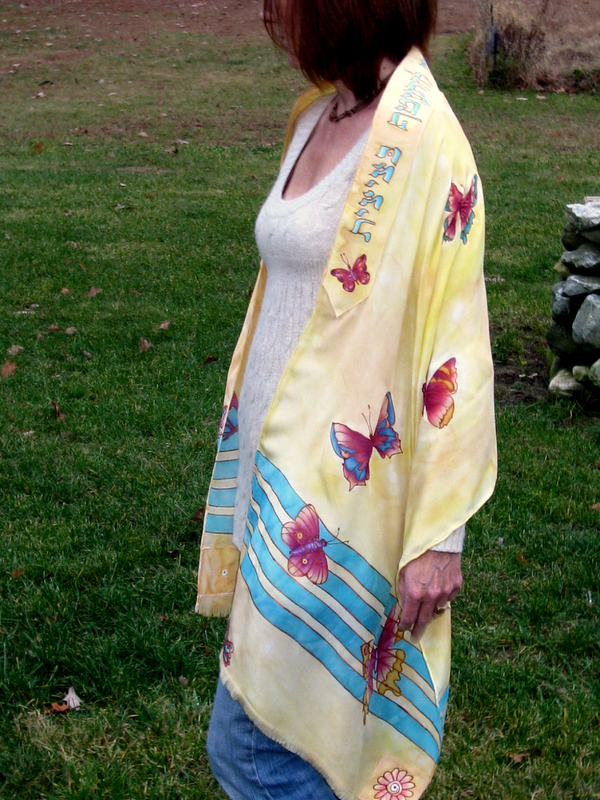 This tallis will come with a coordinating wool kippah. Hopefully all will arrive in time for the customer’s birthday. 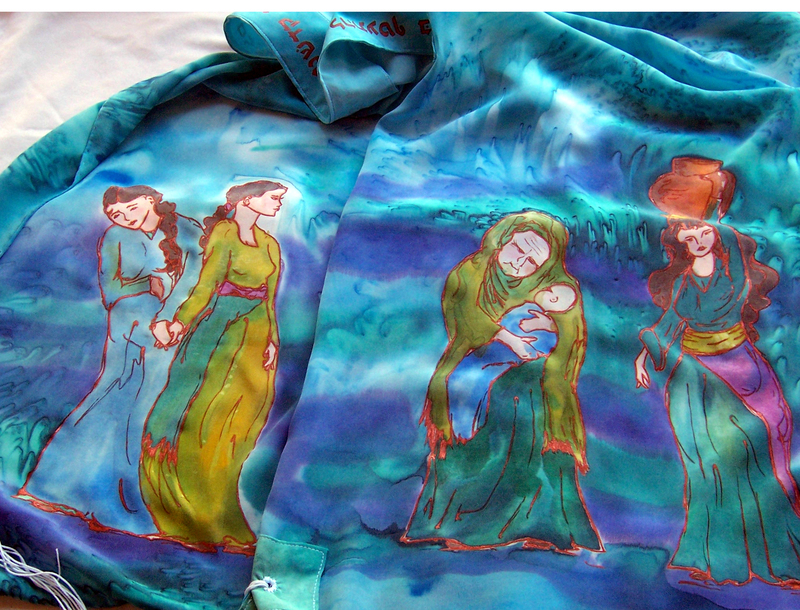 The Making of a Tallis (part 2): Painting the silk and tying fringes. 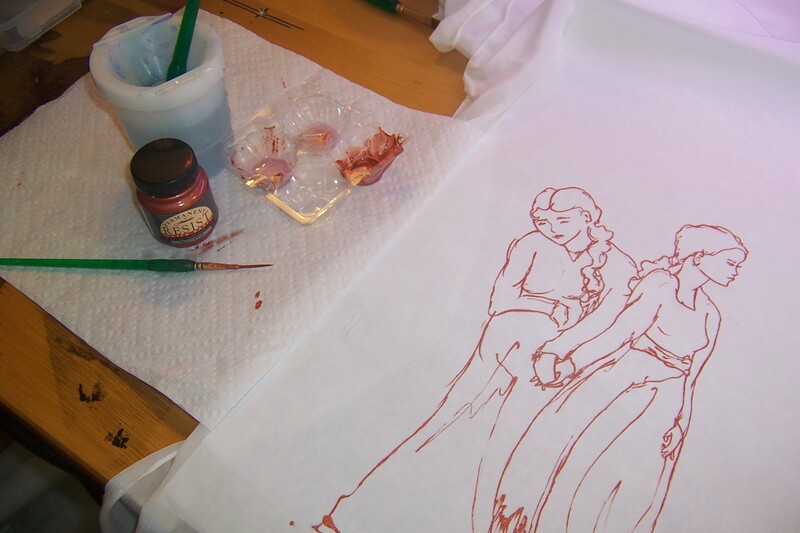 First I trace the image onto the back of freezer paper (the un-waxed side) I make sure I reverse the image when I do this, so it will come out the right way when I iron it onto the silk. 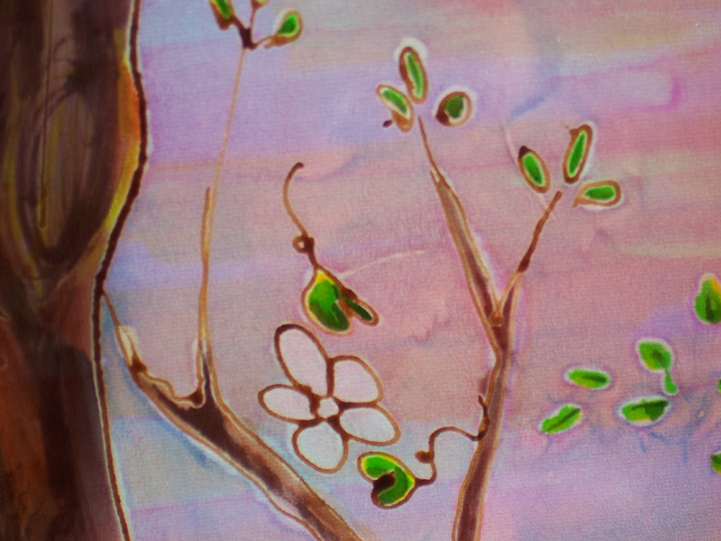 Painting the resist onto the silk. 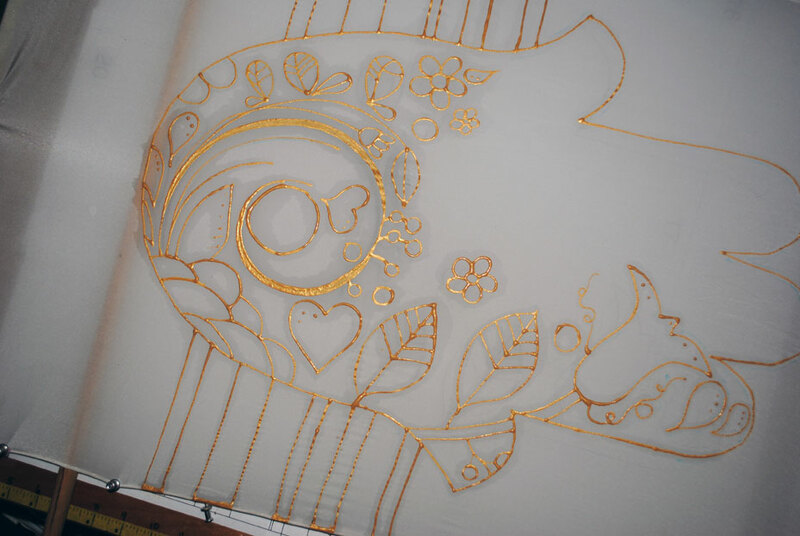 hold the silk up to the light to make sure there are no gaps in the lines. If there are any obvious gaps, I touch them up. Then I paint the whole image with plain water to be sure I haven’t missed a spot. 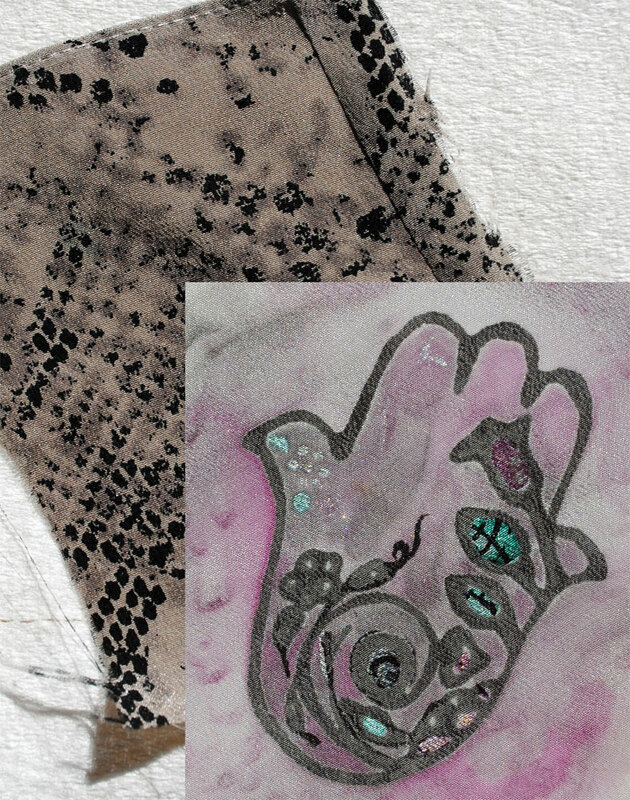 If any bleeding shows through, I touch up again with resist. Lather, rinse, repeat until all gaps are thoroughly sealed. 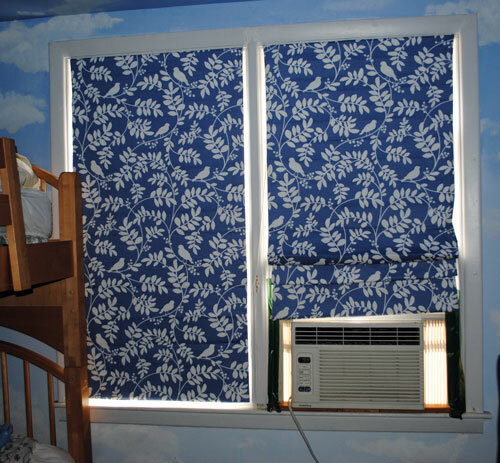 This may seem time consuming, but it saves a world of headache in the long run. Then I filled in the figures with clear, water soluble resist so I could paint the background without fear of messing interfering with the colors later. I then painted in the background freely using logs of salt and splattering. It was very messy and loose and fun. 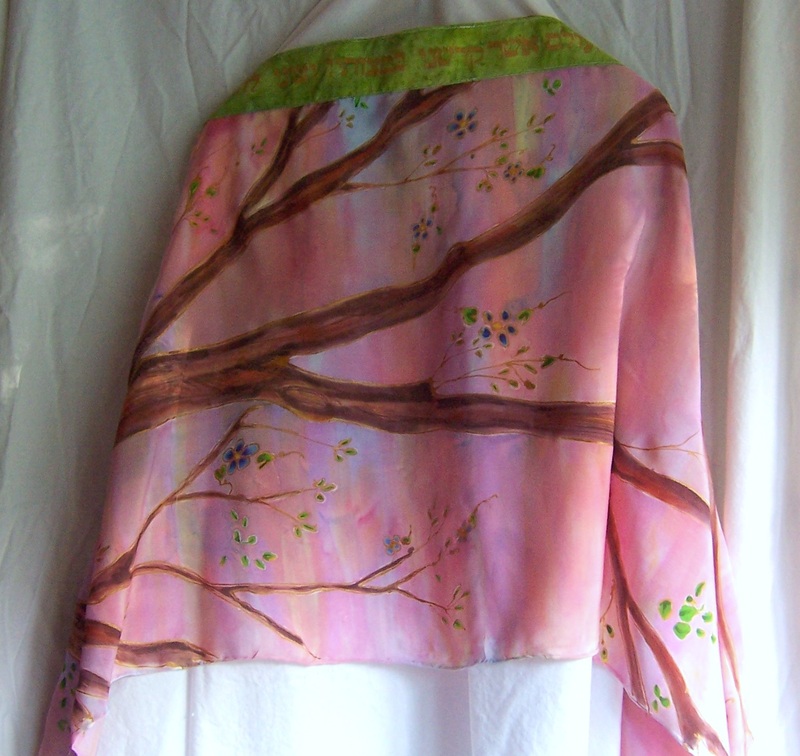 I used silk paints (rather than dye) for this project. 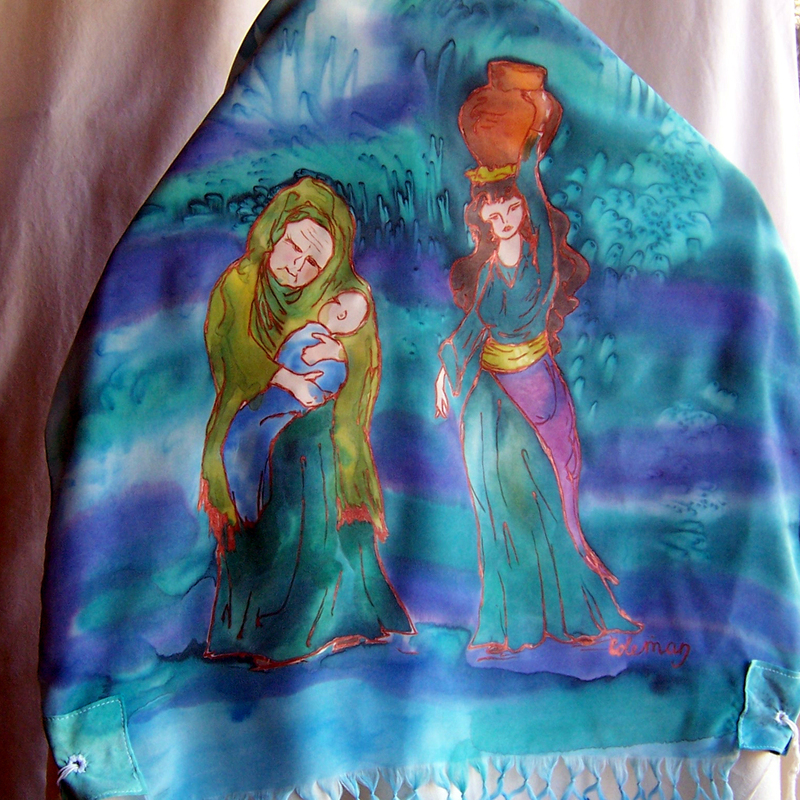 When the background was thoroughly dried and cured, I washed the silk with synthrapol (to prevent back dyeing), ironed it dry and filled in the figures. 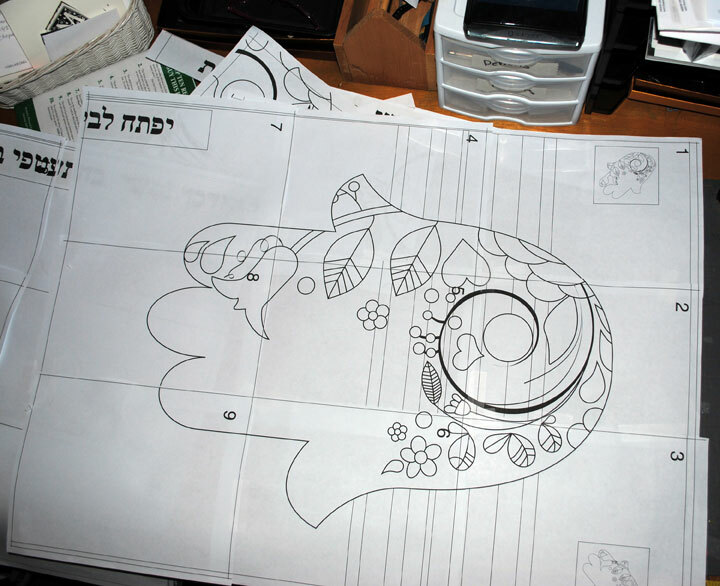 This was a much more controlled process, a bit like coloring in a coloring book. 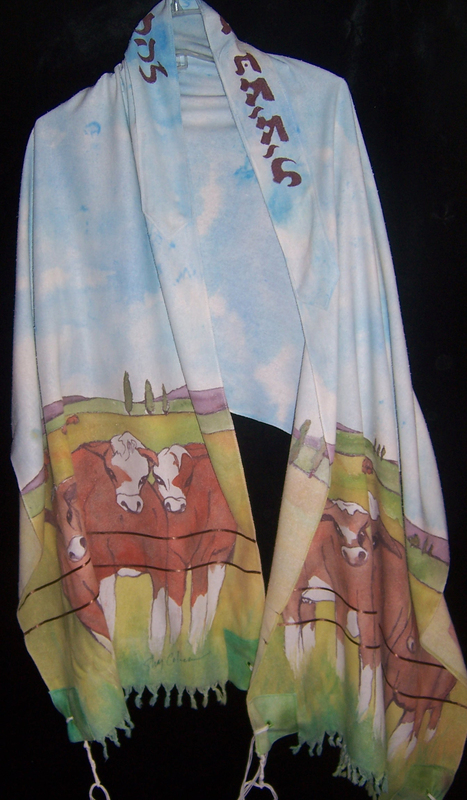 Again, once the paint was dry I ironed it to cure it then washed again. When all the components of the tallis are complete, I then sew the corners and atarah on, make an eyelet hole on each corner and then tye the tsitisit. With most of my commissioned works, I like to make two. This allows my customer to be happy and takes the pressure off me as far as trying to be a mind reader and guess what the customer is envisioning. The customer gets their choice between the two, and the second goes for sale in my shop. The first has a dark blue atarah and corners which contrast nicely with the background. The customer ultimately picked this one. 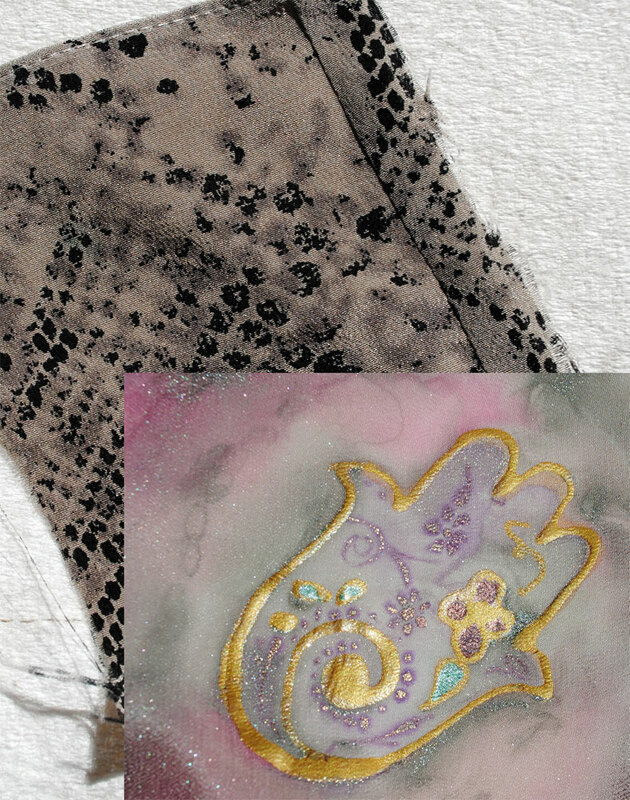 The second has a lighter atarah and corners that blend in with the background. This one sold about a month later. 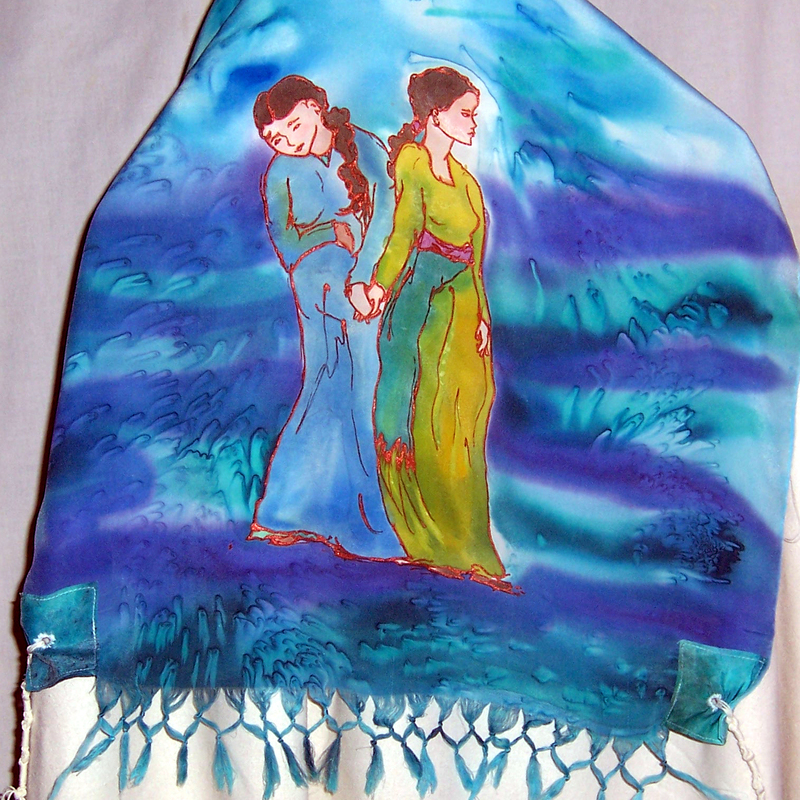 To order a custom tallis, please email me at cozycoleman@hotmail.com or visit my Judaica shop to purchase already made items. You are currently browsing the archives for the tallit category.